November and December are months were people begin thinking of creating gifts for their family members. Whether you celebrate Christmas, Hanukkah, or another celebration, it is equally likely that you will be thinking of gifts and giving. While there are many lists online of what people can give to writers, it is harder to find a list of writer-ly gifts to give to other people. If you want a list of gifts for writers, all I can say is that a collection of blank notebooks, a fancy pen, or a book from a favorite author or in a favorite genre, are all good choices. However, this list is for the writer as the giver, rather than the recipient. Writing is A Gift From the Heart: While physicality is standard in most gifts, sometimes the most treasured gift of all is one that has less emphasis on its physical presence and more emphasis on its meaning. If you enjoy crafting poetry, and have some skill with a pen (or are skillful in choosing fancy fonts and papers for your printer) a “What I love About You” (or “When I think of you”) gift may be well appreciated. What this gift is, is a simple list or poem that details things you love about that person. It can be for both your lives, or it can be within the last year if the list would be too long otherwise. Once you have the list constructed, either write it on fancy paper in calligraphy, or print it in a suitable font on said fancy paper. Then frame, or otherwise make a way to present the words, and then wrap for delivery. Another heartfelt gift is to write up the memories you have of yourself and the person. Whether it is sibling adventures in the back yard, or memories of a child’s first years, these precious memories will often be equally precious for them. At the very least, writing them down and saving the document, as well as giving the other person the copies, is a sure way of preserving the memories for when they do become precious and valued. If you have some pictures from those incidents, they can be paired with descriptions of the memory for an even more memorable gift. Many families have stories that are brought out and re-told at every family get together. Whether it is how Great Uncle Bill fought in WWII, or how Great Great granddad tricked the Prussians in WWI, or even how Aunt Margie always got into scrapes at school, these stories are precious to your family. An awesome gift, would be to write down those stories, if they are not already written down, and get them printed and bound (CreateSpace is awesome for this) as a keepsake gift. Another gift that could well become an heirloom is that of writing a story staring that family member. IT could either be in something that they have always wanted to do, like being a celebrity maybe, or do something like treasure hunting or deep sea diving. Or, you could put them into a fan-fiction of their favorite series. Bonus points if you can find out their favorite scene and work them into it in a seamless manner. An alternative on the fan-fiction, is to find out their favorite genre and then write a story in that genre for them. In this case, it is the genre that is the focus, and inserting them into it is optional. Depending on your length of story, all or any of these written story options could be printed by Creatspace at a nominal cost to you, and would make amazing gifts. For younger children, a children’s book especially for them could be a lovely gift. You can either self-illustrate, pay for illustration, or you could do a child illustrated version, which would be even more fun. Most stories for young children only have 5-10 words per page. Write the story, and put it into large font. Print on your printer, and slip into the clear plastic page protector covers. Bind in a normal binder, and add a picture or fancy title for the front. Give with a set of washable markers and let the child draw their own illustrations. The marker can wipe off the plastic page protectors if the child is not satisfied with the drawing, or get completely erased if the child wanted to start again. Alternatively, if you don’t want to wipe off the child’s artwork, you could just print the story and staple together. When the child had finished drawing, the story could be tucked away and a new one printed for fresh coloring later on. Offer to do editing, beta-reading, or proofreading for another writing family member. Often people suggest giving coupons for gifts that involve your time. So, teaching someone how to use writing software, or agreeing to give an hour or two of your time to beta-read one of their works, may also be well appreciated gifts (at least if, like me, you end up with more than one writer in the family). Offer to write a family member a story to their specifications. While this is a little more complicated than simply writing a story that you think they would like. Writing a story to another’s specifications can be a stretch, and can also save you from writer’s block as you don’t have to worry about what to write about. A story with their story idea can also end up as more special, since they helped in its creation. Compile a paper or collection of articles on a topic the person is very interested in. For example, if someone is very interested in Scotch Whiskey, they may well be interested in an easy to read compilation of recent and historical articles, facts, and general information about their topic of interest. When compiling, you only have to worry about joining or sometimes re-writing some sections, as you are not actually writing a book on the topic (even if you do end up doing enough research to have written said book by the end of it). Of course, pairing such a compilation with some of the said “interest” will probably make it better received. 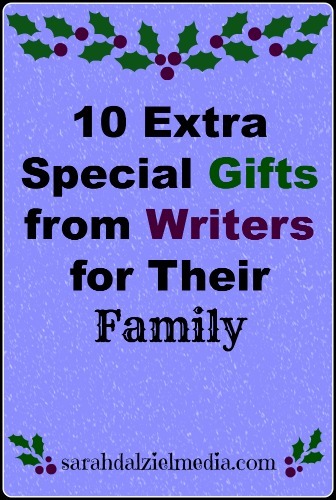 What do you think would make good gifts from writers for other family members? Would you appreciate any of these gifts from a writing friend or family member, or would you suggest adjustments for them?